What's the Secret to Building an Analytics-Driven Marketing Organization? Each year, the ANA Genius Awards for excellence in marketing analytics recognize the best, brightest, most innovative and most impactful work in marketing analytics today. In past years, winners and finalists in this prestigious award program (which is presented by Neustar MarketShare) have included such companies as Intel, Fidelity, LEGO, Citrix, USAA and C Spire. 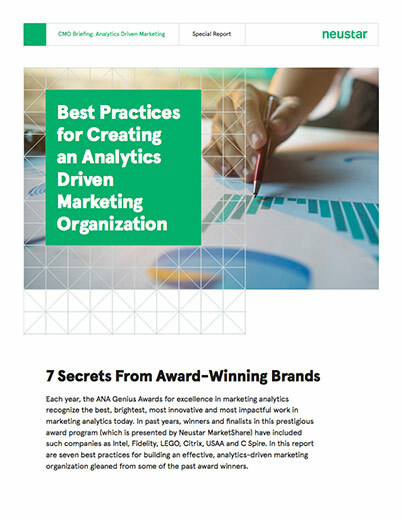 In this report are seven best practices for building an effective, analytics-driven marketing organization gleaned from some of the past award winners. Gain Wide Internal Buy-in: The Best Don’t Go It Alone. APPROACH EVERY LEVEL OF THE ORGANIZATION. That’s one of the key lessons from Intel. Their analytics team provides clear and simple presentation materials in customized packages targeting one senior Marketing and Finance executive at a time. In addition, the team reaches Intel’s marketing community by integrating key insights gained through analytics in executive keynotes, short videos and training sessions. Also, the team engages with key marketing stakeholders to ensure their questions are addressed as analytics models evolve. GAIN CROSS-ORGANIZATIONAL GUIDANCE. One best practice that Citrix points to is the creation of a cross-functional, global team that meets regularly, reviews the data, and advises next steps. KNOW THE DATA YOUR STAKEHOLDERS WANT. As a leading research firm wrote in a case study about USAA, one of USAA’s key wins was understanding what Finance wanted from the analytics project. That agreement up-front laid the foundation for cooperation and joint planning on which marketing programs were working, and which were not. INVITE THE TOUGH QUESTIONS. The case study also noted that USAA’s analytics team invites questions and challenges, which builds confidence in the model and leads to broad support. Asking the right questions means being more exacting about how measurable your marketing analytics questions really are, and braver about what you’ll do with your learnings. How should you think about the technology you’re exploring? Here’s how USAA thought it through. It’s not enough to get interesting insights—you need to validate learnings to know if you’re right. Intel and Neustar MarketShare, for instance, combine “stats and sensibility” to validate learnings. Check for acceptable measures in marketing contribution, source of volume change, and relative effectiveness of each touch point (coefficient). Conduct sanity checks against known business truths and existing knowledge. Look at mean absolute percentage error (MAPE) and t-statistics to gauge statistical fit. One commonality among many analytics-driven brands is the ability to make connections from one business group to the next—or one business to the next. Citrix looks at halo effects. Intel looks at the impact of ingredient brands. C Spire carries marketing insights across multiple departments, like customer service and sales (as the analytics program guides touch points including the 1-800 number, email, text marketing, mobile apps, and retail POS). The obvious example here is using digital insights to guide programmatic buys, but it’s hardly the only one. Rapid, analytics-based insights allow for pivots in traditional media buying as well. In the end, results are what get attention internally. Here’s a sample of the kinds of impact that marketers have seen. USAA’s Applied Analytics team surged from selling nine percent of its products from marketing investments in 2008 to 29 percent. Incremental marketing investments in 2013 generated more than $100 million in revenues for Intel. The marketing mix optimization that it drove generated from 1% to 3% increase in sales contribution from marketing in one year alone. Within six months of its new analytics program, Citrix saw a 5 percent lift in sales and a 465% return on its investment. C Spire increased the effectiveness of retention campaigns by 50%. Additionally, the integration of predictive upsell campaigns delivered the equivalent of an additional 3% of sales with no additional distribution costs or employees.